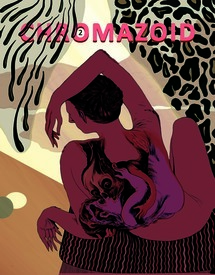 Things start to get more interesting with Chromozoid's second issue. Again we have a squarebound, full color, magazine size publication jam-packed with comics. This issue runs a whopping 108 pages and some amped up, electrified art! While the current of horror running through the first issue continues through this one as well, readers will also find stories with a bit more sexual charge. All in all this issue raises the stakes and delivers a more potent cocktail of emotional charges than the first. A. Degen fans will rejoice to get their hands on this issue's "Soft X-Ray" tale, and any sighting of work by the reclusive (well, at least as far as print publication goes, anyway) Sakura Maku is always a cause for celebration. Austin English pounds the pavement, and the paper with his pencils in eight pages of rough and ready urban action. Grant Reynolds and Nicki Yowell deliver a science fiction/horror hybrid gross-out gag-fest in "Vampire Tampons from Outer Space." 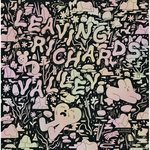 There's plenty more on hand here before Lale Westvind closes out the book with an "Evening Flight." NOW ON SALE for a SUPER DEAL price!